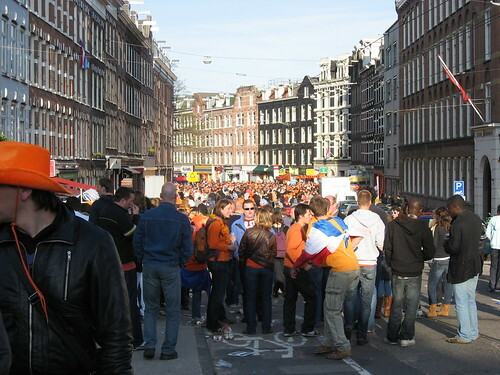 One Amsterdam adventure that I can't really compare to anything else I've ever experienced is Queen's Day. Imagine a city-wide anarchic garage sale and festival with costumes and beer. Lots of orange, particularly inflatable orange crowns and orange feather boas. DJs and bands on every street. 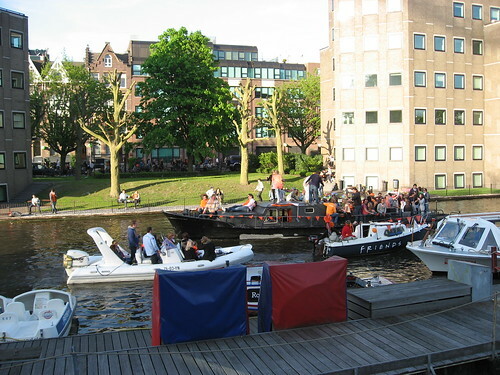 Boats of revellers, also with music and beer. Street food of all types. Strange, strange ways of making some money (like smashing plates on pictures of the royal family, or having people throw eggs at someone's naked bottom sticking through a cut-out, sponge-toss style). People everywhere through the whole city, partying on every corner, all day long. As you might guess, we didn't really get terribly good pictures since we were busy taking in the atmosphere and eating delicious things (blood orange sorbet, Italian sandwiches with fresh buffalo mozzarella, and poffertjes, amongst other things). The sort of similar holidays in Canada would be St-Jean Baptiste Day in Quebec or Canada Day in the rest of Canada. In Canada, there might be an event at some exhibition grounds, with music and fireworks. But it would all basically be contained to that one space. In Amsterdam, it was the entire city. Every street was filled with people. And the canals with boats. The Museumplein was packed and had the largest stage we saw, but by no means the only one. There were small stages and bands and DJs set up all over the place. 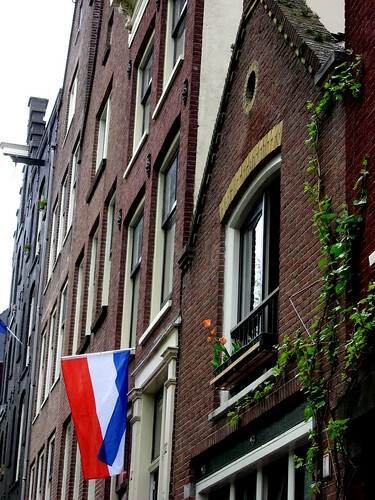 The streets of the Jordaan were lined with people's garage-sale type tables and blankets (possibly selling all the stuff they rashly purchased on last year's Queen's Day). Food stalls were everywhere: from the usual frites trucks to someone who decided to sell cupcakes to booths set up outside cafes. It's a "vrijmarkt" or free market day, where you don't need a license to set up a stall, and people were selling everything and anything like a giant flea market crossed with a carnival. It was awesome. Amsterdam sure knows how to celebrate. 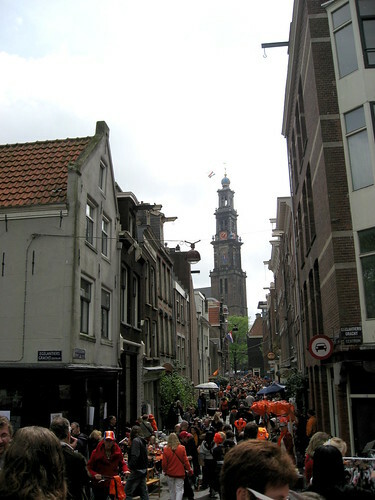 Apparently, the population of Amsterdam doubles for the day because people come in from outlying areas, and then all those people are out in the streets and squares, dancing, eating, drinking beer, and wearing orange.